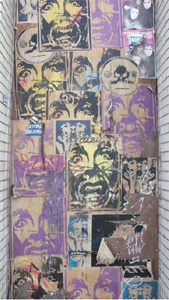 In 2009, Staub combined portions of several of his graffiti photographs to create a video backdrop for the song East Jesus Nowhere for use on Green Day’s tour. The video backdrop appears below. The video backdrop was displayed on Green Day’s tour during the playing of the four minute song, East Jesus Nowhere, but was not used in any other material associated with the tour. When Seltzer, who claimed to be a “tremendous fan” of Green Day, saw his image used as part of the video backdrop he attempted to contact Green Day to at least obtain credit for creating the artwork featured in the backdrop. Apparently nothing could be worked out and six months later Seltzer sued. Green Day moved for summary judgment claiming its use of the artwork was fair use. The court agreed and dismissed the case. The court then ruled that Seltzer needed to pay Green Day’s attorney’s fees and costs in excess of $200,000 for bringing an allegedly “unreasonable” lawsuit. Ouch. In making its ruling the court analyzed the four factor fair use test codified in the Copyright Act. Regarding the first factor, “the purpose and character of the use, including whether such use is of a commercial nature or is for nonprofit educational purpose.” The court found that Green Day’s use was essentially non-commercial since they did not directly derive revenue from the photograph and were just giving it away as part of their highly commercial concert. 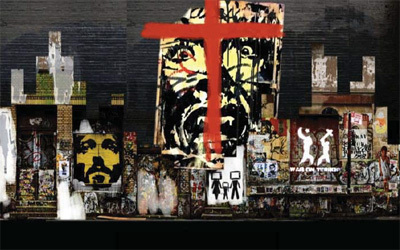 The court also found that defacing Seltzer’s artwork with a red cross and adding other images around Seltzer’s work made Green Day’s use of the artwork “transformative.” The court found that since the original artwork had nothing to do with religion, digitally spray painting a red cross over the image and using it as a backdrop for a song for which it was not intended strengthened this artistic transformation. The court held that this factor “strongly” favored Green Day’s fair use argument. Does this determination suggest that defacing someone’s artwork is presumptively fair use? A form of free speech artistic criticism perhaps? What if the artwork was a copyrighted sketch of Mickey Mouse surrounded by children burning in hellfire? Would such a defacement still “strongly” favor fair use? Regarding the second factor, “the nature of the copyrighted work,” the court acknowledges Seltzer’s creativity in the artwork but focuses on the fact that the artwork was published prior to the infringement. The court cites Kelly v. Arriba Soft Corp., 336 F.3d 811 (9th Cir. 2003) for the proposition that published works are more likely to qualify as fair use because the first appearance of the artist’s expression has already occurred. The court holds that this factor “slightly” favored Seltzer’s non-fair use argument. Regarding the third factor, “amount and substantiality of the portion used in relation to the copyrighted work as a whole” the court found that although Seltzer’s image was almost entirely reproduced, but because it was one of many images featured on the backdrop that this factor weighed slightly in favor of Green Day’s fair use argument. The court apparently decided to ignore the fact that Seltzer’s image is significantly larger than all of the other images in the backdrop and is clearly the focal point of the backdrop. Regarding the fourth factor, “the effect of the use upon the potential market for or value of the copyrighted work.” The court found that Seltzer had not presented any evidence that the market for his work had been damaged by Green Day’s use. The court found that this factor also weighed in favor of Green Day’s argument for fair use. After weighing the factors discussed above, the Court concludes that Defendants’ use of Plaintiff’s Scream Icon image is a non-infringing “fair use” under Section 107 of the Copyright Act. Staub’s inclusion of Scream Icon as a composite image in the video backdrop for East Jesus Nowhere was highly transformative, and the record is void of evidence suggesting that such use adversely affected the potential market for Plaintiff’s work. As a matter of law, the findings on these two factors outweigh any other fair use consideration favoring Plaintiff. See Sandoval v. New Line Cinema Corp., 973 F. Supp. 409, 414 (S.D.N.Y. 1997). Accordingly, Defendants’ motion for summary judgment on Plaintiff’s claims under the Copyright Act is GRANTED. Seltzer’s lack of fame and the fact that the Scream Icon artwork was not known to the judge seemed to weigh heavily against Seltzer. It seems hard to imagine that this case would have the same result had a red cross been digitally spray painted over a well known piece of art. Would a change in contrast and a red cross over the famous photograph of three year old, John F Kennedy Jr. saluting his father’s casket be “transformative” enough? Probably not. What about the musical equivalent of a red cross screeched over the Beatles’ song Let it Be? Highly doubtful. Does this mean that famous artwork is entitled to more copyright protection than an unknown artistic expressions? Or is it just harder to “transform” artwork you are already familiar with?